In addition to deep space imaging, the Astro-Tech AT8IN is also usable for solar system imaging as well as deep space and solar system visual observing. Solar system visual contrast will be somewhat reduced compared to a longer focal ratio reflector because of the AT8IN’s larger secondary mirror that has been optimized for full-field photographic illumination. However, the visual performance will still be much more than acceptable, and the 800mm focal length of this Astro-Tech makes it quite possible to achieve the high powers needed for detailed lunar and planetary observing. 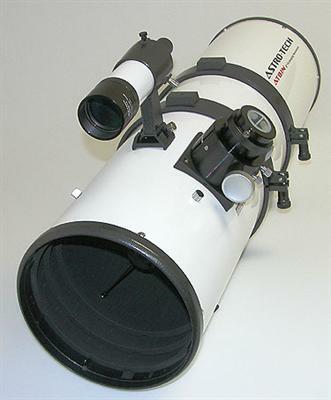 Simply add optional 1.25" or 2" eyepieces, and perhaps an optional Barlow lens, and this Astro-Tech Imaging Newtonian will provide you with crisp and sharply detailed close-up views of the Moon and planets. Shown to the right is an outstanding image of M33, the face-on spiral galaxy in Triangulum, taken by Craig & Tammy Temple in Tennessee. This was taken with a self-modified Canon Digital Rebel XT DSLR. It combines 98 separate 240 second exposures taken over two consecutive nights. This image of M33 shows the kind of results dedicated astrophotographers can get with the economical AT8IN. No-tool push-pull mirror cell: The die-cast aluminum primary mirror cell has six large hand adjust push-pull collimation knobs. These make it easy to collimate the primary mirror without tools, even while wearing gloves or mittens in cold weather. To further ease collimation, the primary mirror is precisely center-spotted. The Sky & Telescope review praised the “solidly made" primary mirror cell and secondary mirror holder. The white-painted 32" long x 9" diameter (with 9.25" diameter front and rear cells) Astro-Tech optical tube is fabricated of rolled steel, to allow the mirrors to cool to ambient temperature more quickly. While the rolled steel optical tube is a little heavier than a more-costly aluminum tube, the Sky & Telescope review points out that “it also helps make it a very rigid setup, which is a good thing for astrophotographers." The scope’s tube end rings are sturdy die-cast aluminum, to protect the tube during transport and provide exceptionally rigid support for the optics, “adding to the scope’s overall rigidity," according to the Sky & Telescope review. 2" dual-speed Crayford focuser: The precision-made 2" Crayford focuser drawtube ends in a 2" accessory holder. A 1.25" accessory adapter is standard equipment. Both the drawtube’s 2" accessory holder and the 1.25" accessory adapter have non-marring compression ring eyepiece/accessory holders. The focuser has two coarse focusing knobs. One knob also has a smaller concentric knob with 10:1 ratio reduction gear microfine focusing. This provides exceptionally precise focus control during critical CCD imaging. The focus knobs have ribbed gripping surfaces so they are easy to operate, even while wearing gloves or mittens in cold weather. A drawtube tension knob on the side of the focuser lets you adjust the drag on the focuser drawtube to hold various equipment load weights while focusing. A second knob lets you lock in a precise photographic focus. The drawtube has 34mm (1.35") of travel. There is 80mm of back focus available from the top of the focuser’s 2" accessory holder to the image plane. A 2" diameter x 35mm long extension tube is provided to match the back focus requirement to your particular photographic application. The 35mm extension tube has a non-marring compression ring eyepiece/accessory holder. Split tube rings: A pair of die-cast aluminum hinged split tube mounting rings are provided. Each ring has a flat boss on its underside with a 1/4"-20 thread mounting hole for installing the ring on a Vixen-style or Losmandy-style “D-plate" dovetail mounting plate. This lets you mount the scope on virtually any equatorial mount. In addition, there is a flat boss with a 6mm metric hole on the top of each ring. This allows you to install a separate dovetail on top of the optical tube for mounting photoguide rings and a guidescope or similar accessories piggyback on top of the AT8IN. The lightweight optical tube (18 pounds tube only; 21.6 pounds with rings and finderscope) rotates in its felt-lined die cast cradle rings to bring the focuser and finder to the most comfortable viewing position. Click the button below to add the Astro-Tech 8" f/4 Imaging Newtonian Optical Tube to your wish list.